The new Cyrus Soundkey, an ultra-portable DAC/headphone amp designed to upgrade the sonic quality of audio played back from smartphones and computers, will be available in South Africa soon. The tiny, ultra-slim device easily connects to iPhone and Android smartphones, as well as portable and desktop computers. In the case of iPhones, however, a Lightning camera kit is required for the connection. The Soundkey features a small but robust aluminium casing and is compatible with a range of music file formats, including AAC, FLAC and MP3. 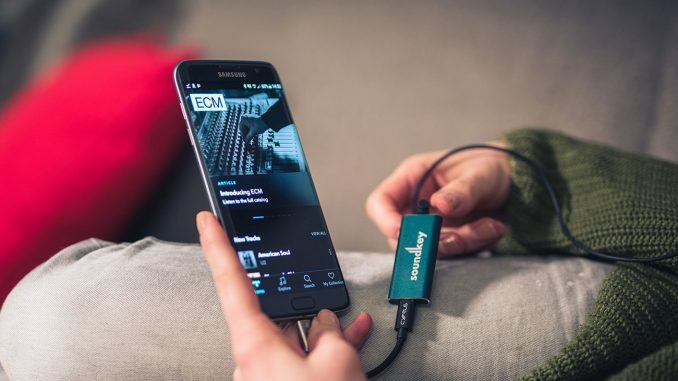 It plays back files of up to 96 kHz/24-bit resolution, and there’s no need for batteries or charging as DAC draws its power from the source. Cyrus claims the high-efficiency circuitry of the Soundkey minimises power draw from the device it’s connected to, while gain is ample to drive even high-impedance headphones. The Cyrus Soundkey comes in a choice of four colours – black, red, blue and purple – and is expected to go on sale in South Africa at the end of May. The provisional recommended retail price is R2 299, including VAT.